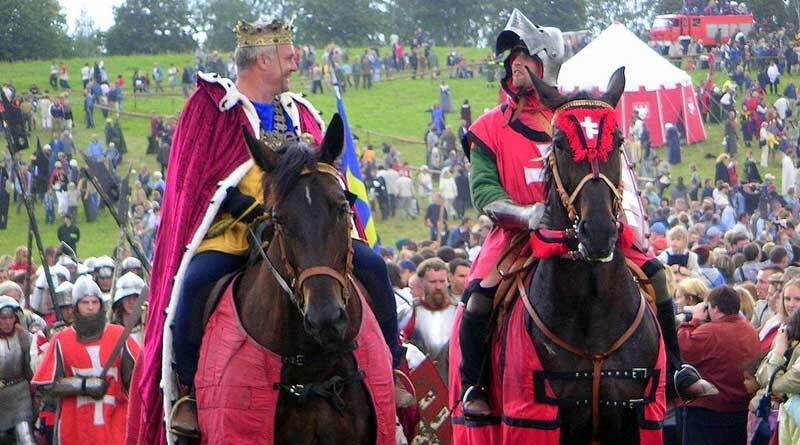 A retired Army lieutenant colonel has died in the US after he was impaled on his jousting lance during a medieval competition. Peter Barclay, 53, died last weekend in the freak accident in Williamstown, Kentucky. In the event, riders had to pick up their 7-foot long lance from a hay bale then use it to pick up a paper plate. The spears weigh from two to three pounds, and have a metal tip on the end. Barclay had picked up the plate from the ground and was finishing the course when the accident happened. Society for Creative Anachronism president John Fulton said the lance’s tip went into Barclay’s stomach. Barclay rode his horse out of the arena and dismounted, handing the reins to a nearby friend and asking them to call his emergency contacts and 911. He then took some steps and then collapsed. He died while being airlifted to hospital. “Something happened with that spear, and he lost control of it or it turned, hit the ground, and as his horse was moving, the tip of it went into him,” Fulton said. Barclay performed under the name “Master Rhys Terafan Greydragon”. Barclay was a long-time member of the Society for Creative Anachronism, and had been involved in medieval events and reenactments for more than 30 years, performing around the world. He performed under the name “Master Rhys Terafan Greydragon”. At the time of his accident, he was wearing a short jacket, as full body armor is not required during timed events, when there are no other riders in the ring. SCA Marshal Alan Gravesend said the society was investigating “what might have led up to the accident, and what specific measures should be taken to ensure that this does not occur again”. Barclay was raised in La Cruces, New Mexico, and lived in Woodbridge, Virginia. He had recently retired, having served the past four years at the Pentagon. He is survived by his father, Jack, brothers John and Charles, his wife Deborah, and their two daughters, Amy and Tarythe.